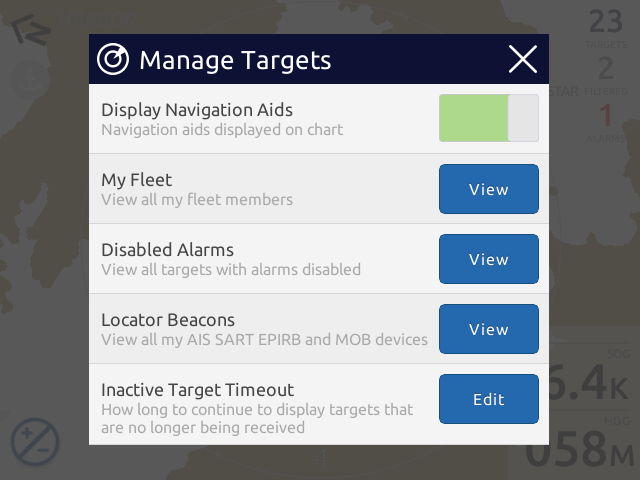 Use the Manage Targets dialog from the Plotter Menu to review the targets you have added to your fleet, those that have disabled alarms, or to manage your MOB device labels. In those areas that are cluttered with AIS Navigation Aids you can opt to remove them from your plotter view. Targets are inactive when they are no longer being received. However, they will remain on the screen in their last known location for some time after their last transmission was received. You can control this amount of time using the Manage Targets dialog. If a target hasn't been received in this amount of time, it will no longer be displayed. The time you select applies to all targets and not just those that have specific settings such as fleet or disabled alarms.